You better watch out, you better not cry. That’s right, New York: The red suits are coming! During SantaCon 2018, an army of jolly Kris Kringles, on a mission to fill out their costume with a beer belly, will frolic around Manhattan for a day of festive revelry. The event returns this weekend on Saturday, December 8, and we got an exclusive first look at the full venue list (more than 60 spots total) where Kris Kringle, Mrs. Claus, gingerbread men, snow pals and other Christmas-themed characters are welcome. Don’t be fooled by the other imposter SantaCons you may see online. This is the original, and it’s the only one (that we know of) that uses its proceeds to give back to charity. 'Tis the season for giving back, after all. The event kicks off at 10am. (What? You can’t properly day drink unless you start early.) But if you're traveling from out of town, you won't be able to pregame or keep the party going while you ride the LIRR or Metro-North. The MTA released a 24-hour alcohol ban for the event to ensure everyone's safety. It begins at noon on December 8 and lasts through noon on December 9. Don't be naughty! 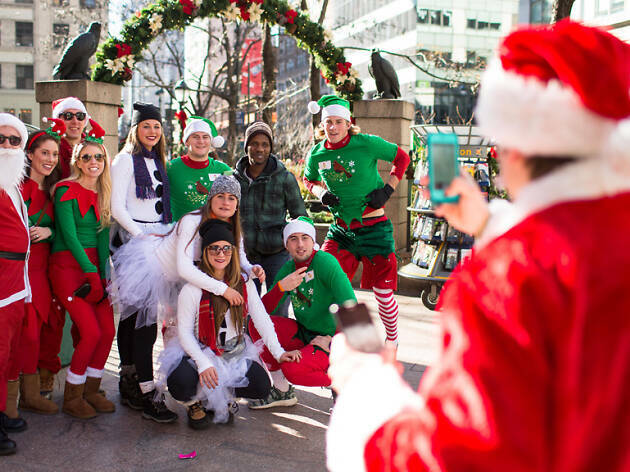 Keep your eyes on the @Santacon Twitter page for more updates and news day of. Just text follow @santacon to 40404, but make sure your phone number is associated with your Twitter account for this to work.